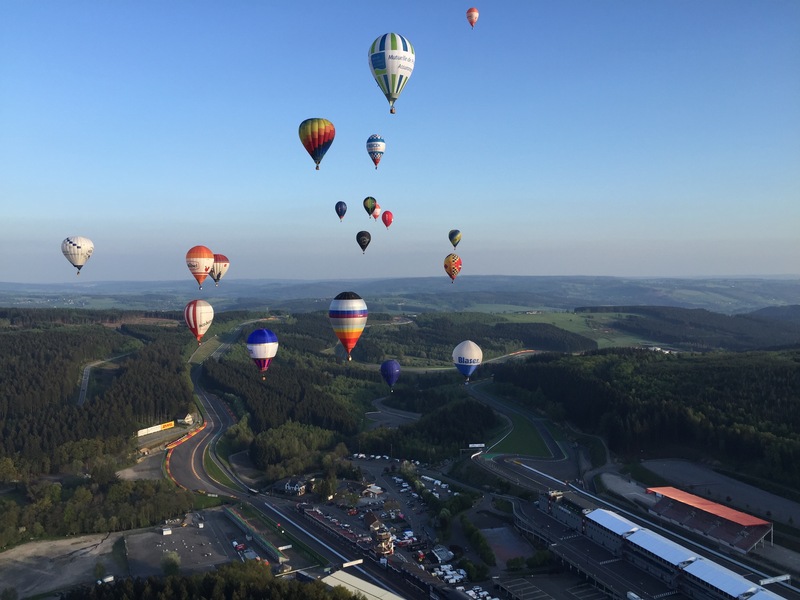 After a rainy morning yesterday and a cancelled flight, yesterday evening the weather was with us to take off at Sport Automobile circuit (Francorchamps). 3 tasks on the TDS, JDG-3DT-HWZ. The HWZ were at 20km from CLA, with an average wind of 10 knots, green flag at 20h00, and end of search period at 21h00 … With a quick calculation we guess that it will be already hard to get the last task in time. The JDG was really nice to play, and I think the pilots enjoyed it! just after the take off we flew over the sport circuit, that was spectacular! 3DT was a cake, some pilots got really perfect results and it shows the high level of this competition! Results of this 3 tasks are already online! It seems that many people all around the world liked my previous results analyses about the World Championship in Brazil. 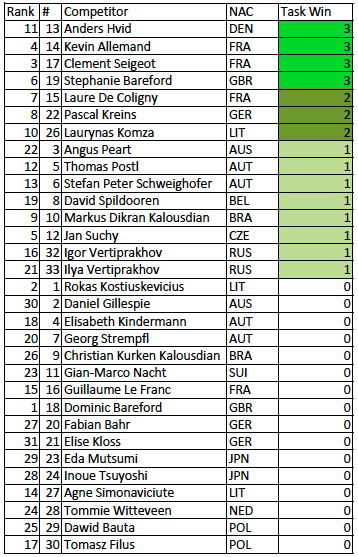 Now that the World Junior Championship is over and everyone came well back home (besides women who were still flying under the rain in Poland as I wrote this post :p), it is interesting to analyse the results in more details. I therefore made an in-depth analysis of the scores and came up with several graphics and tables. I also improved some analyses and tried some new ones. Please let me know your ideas and suggestions =). As a reminder, you can find the official final results here : Official Final Results. First of all, I wanted to announce one amazing number extracted from this analysis: 350 markers finished into the MMA and were measured by the measuring team during this world junior championship! Congratulations to all pilots for this high level, but also big thanks to the measuring teams and officials! And one more, 280 tracks were analyzed by the scorers! Big thanks to them too =). This time I decided to start by an analysis flight by flight in order to have a better view of the championship. 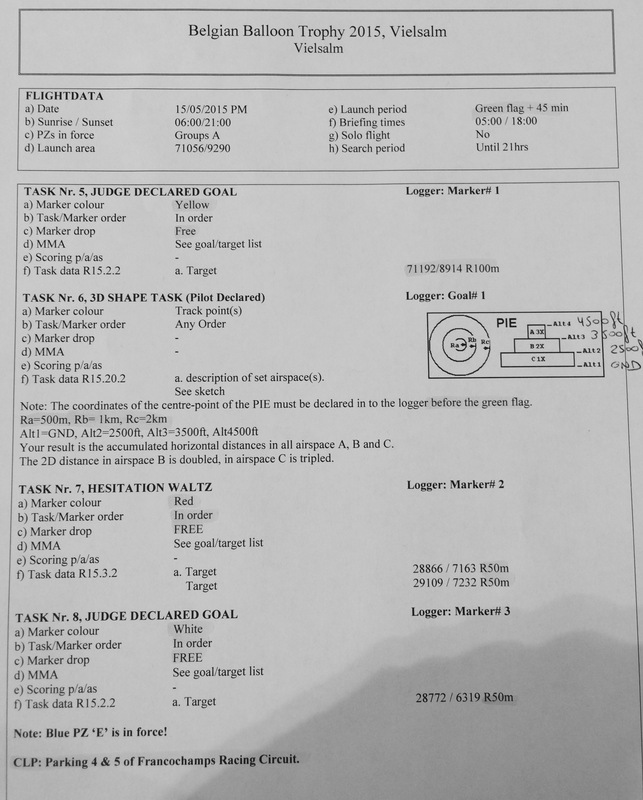 Each analysis page is structured as follow: first you will find the tasks, then the top 3 pilots for this flight, and finally a summary of all tasks where a physical marker needed to be dropped. You will see the numbers of markers who finished in MMA, the average score, and also the number of markers within 10 meters with a little hand-made drawing to represent and show the 10m radius on the target =). Let’s start with Flight 1 as an example. For this first flight, we had to run a 3DD task and an Hesitation Waltz. The top 3 of this flight is composed of Stefan Peter Schweighofer, Stephanie Bareford and Laure De Coligny. I calculated their average score by dividing the total result of the flight by the number of tasks done on this flight. 11 markers finished in the MMA, with 5 in the 10 meters, and the average score is 188 meters! I represented these markers into the 10 meters area =). Generally the most interesting flights to analyze are the morning flights, with 4-5 tasks and really flyable winds to reach the targets. Let’s have a look at the second flight of this championship. This flight is really impressive just by analyzing the markers dropped. We did 3 physical tasks during this flight, and 99% of markers finished into the MMA! The average score of the FIN by gravity is also really impressive, 18m with 19 markers in the 10 firsts meters! Amazing! The Hesitation Waltz target experienced also a really strong rain of markers with 24 markers into 10 meters! 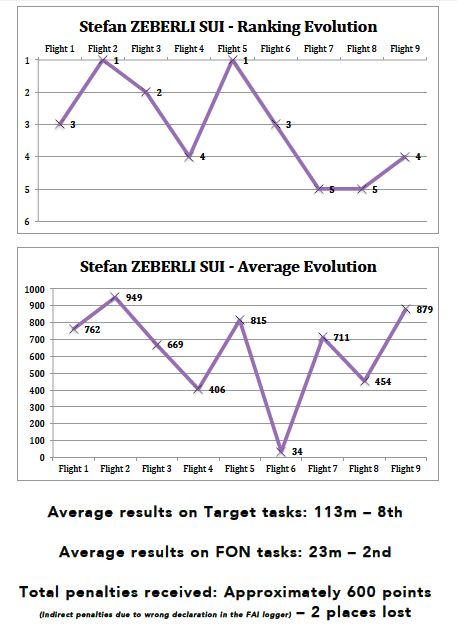 Now we have seen each flight one by one, the next graph represents a summary of the distribution of the tasks set by the event director (Zoltan!). We can see that physical tasks with baggies to drop represent 61% of the tasks! Exclusive virtual tasks (Land Run, Race To an Area, XDI, 3DD) represent 21%, and FON/PDG tasks represent only 18% of total tasks. It means that if you wanted to be one of the top pilots, it was not sufficient to know how to reach targets with accuracy, but you also needed to achieve some virtual tasks which requires some mathematical knowledge and some strategy =). We can thank therefore Zoltan Palhegyi, the event director, for the diversity of the tasks. As a comparison, during the Women World Championship, the distribution of tasks was 75% physical target tasks / 12.5% virtual tasks / 12.5% FON/PDG. Now we can focus on the ranking evolution of the top 10 pilots. We can see here that the 3 winners – Dom, Rokas and myself ^^ – were already in the top 3 after the 6th flight (Dominic even after 2 flights and myself after 3 flights… Rokas came later on but strongly!). I was always very close to Dom and even beyond him once 🙂 Unfortunately we had no 10th flight to reverse the tendency (and I also have to mention that I stupidly missed the last task – MDD – despite the fact that I flew just in the middle of the cross GRRR). 779 points difference on final ranking. Good job Dom!! For the girls, it was even more tight as they really reversed their ranking after almost each flight. One time Stephanie, one time Laure. Finally, only 8 points difference on final ranking. Nice fight and nice job also! 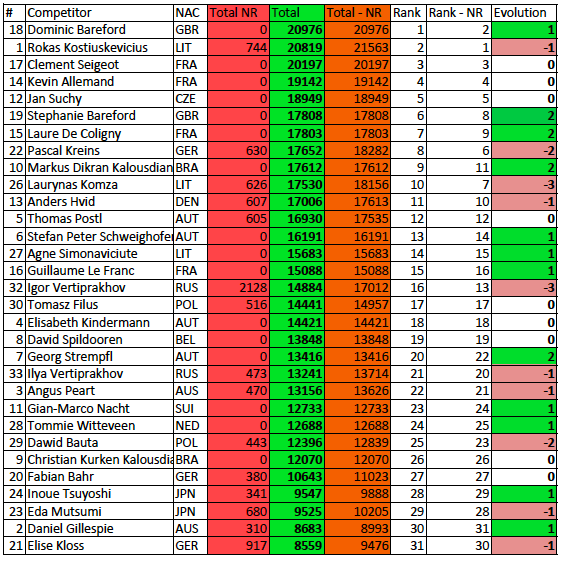 Same observation for Jan and Kevin with 193 points difference on final ranking. Let’s look now at some specific tasks to see which competitors are the best respectively for targets tasks (every tasks involving a physical target and only one marker drop, e.g., FIN, JDG, HWZ, HNH) or FLY-ON tasks. The following table now presents the results only for “physical targets” tasks. This time I tried to enhance the analysis by excluding the worst result of each pilot. These worst results are in red in the table. And it appears that worst results of 67% of pilots are on the task#19. This task required to climb at 4500 ft to take the good wind, but only some pilots believed in the piball and tried it! Globally, Rokas is the best at this target game, with an average of 16m, and his worst result 86 meter! The Bareford family takes the 2nd and 3rd places with 18 and 19m. Unsurprisingly, the top 10 is quite the same than the final top 10 ranking. Now we have analyzed results and tasks, we can look at the penalties and their influence on the general ranking. We can see that compared to the world championships in Rio Claro, the penalties haven’t a lot of impact. Only 4 pilots lost one place due to their penalties! As the penalties didn’t had massive effect during this championship, I was surprised to see so many No Results. That’s why I decided to count them, analyze and see the effect. To do that, I decided to replace a No Result by the average score of the competitors. You can see the changes in this table. The changes should not be interpreted at the individual level, but on a global level (if someone looses a place, then someone can benefit from this!). And the result is really interesting! Igor Vertiprakhov (RUS) lost for example 3 places due to 4 no results. Finally, to close this analysis, you may have a look at the number of tasks won by each competitor. Anders, Kevin, Stephanie and myself, we won 3 tasks each, followed by Laure, Pascal and Laurynas who won 2 tasks each. Surprisingly, our gold and silver winners Dominic and Rokas didn’t won any tasks during the championship! This is a good evidence that only regularity is the path to victory. No matters how brilliant you can be on some single tasks, pilots have to be good every day on every kind of tasks! This wise word will be my last 🙂 I hope you enjoyed this post! 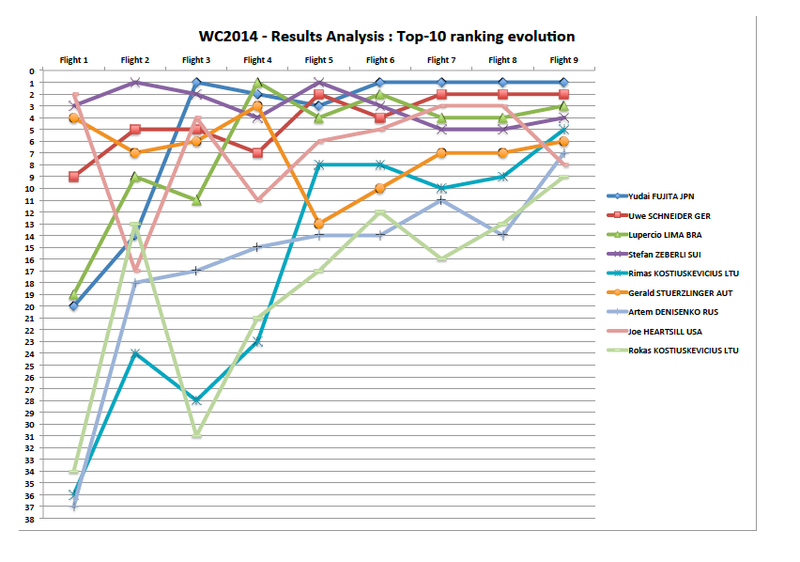 Let’s have a look first at the top-10 ranking evolution across the championship. What does this graph tell us? We can see here that the 3 winners – Yudai, Uwe and Lupercio – were already in the top-5 after the 5th flight. We see also that 3 pilots started quite badly but came back in the ranking after 5 flights: this is the case for the 2013 European Champion and Vice-Champion Rokas Kostiuskevicius and his dad Rimas, but also for my russian friend Artem Denisenko. Unfortunately, Stefan Zeberli, a great swiss pilot I had the chance to meet during Swiss Nationals this year, missed the podium after having been very close to be a world medal winner this year. This table now presents the results only for “physical targets” tasks. The spanish pilot Jose-Maria LLADO was the best at throwing single markers with an average distance from the target of 86m. Here we see also that the US team is much better at this exercise than the FON with 3 US pilots in the top-10 for physical targets tasks and 7 US pilots in the top-20! I know that US pilots are used to these target tasks and experience brings a lot of success 🙂 Similarly, there is a legend saying that the amazing German pilot Uwe Schneider throws hundreds of markers every year during training flights… Looking at his ranking (9th) on target tasks, this might actually hold true! 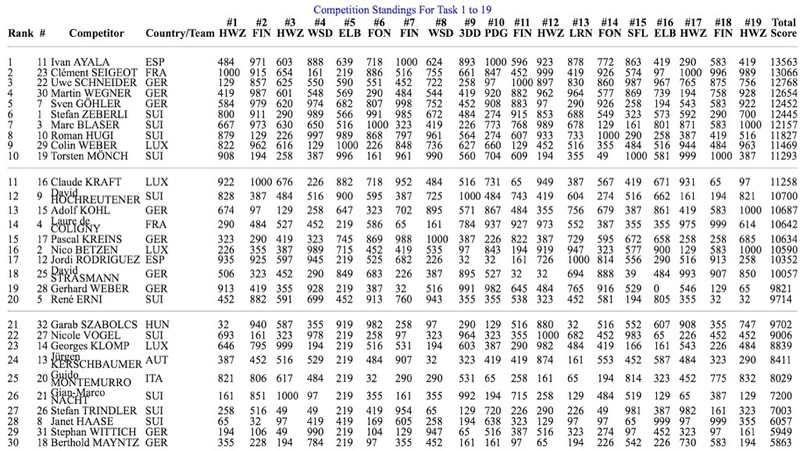 Finally, it is also impressive to look at the mean score for all competitors on Task #22 (HWZ) : only 18m on average. I assume that it was really raining markers that day on these targets! Now we have analyzed results and tasks, we can look at the penalties and their influence on the general ranking. Please note here that some penalties are estimates based on distance infringements. For example, Mark SULLIVAN got a 50m distance penalty due to marker not unrolled completely. In this case, I looked at how many points this pilot would have got without this distance penalty and calculated the difference between his score with and without penalty. We can see here that the penalties for some pilots have consequences on the ranking. My friend Artem Denisenko was quite unlucky here with some logger handling penalties making him loose 2 places at general ranking! I also estimated that Stefan Zeberli loosed approximately 600 points and Ralph Fasler approximately 400 points by entering wrong coordinates to declare the FON of the task #21. It’s not a penalty but I think it’s interesting to see the impact of a wrong logger handling. Regarding penalties, I also have noticed that sometimes not unrolling your marker will make you loose more points (about 850 points in the case of Mark SULLIVAN task #22) than impacting another balloon during a midair collision (500 points for Andrey KULKOV task #5). Unfortunately, the rules are the rules! Finally, I also calculated individual graphs for the top-20 pilots with the ranking evolution, the evolution of mean score for each flight, their ranking for FON tasks, ranking for physical targets tasks and finally the impact of penalties on their ranking. In the case some pilots not in the top-20 are also interested in having their individual graphs, don’t hesitate to contact me! 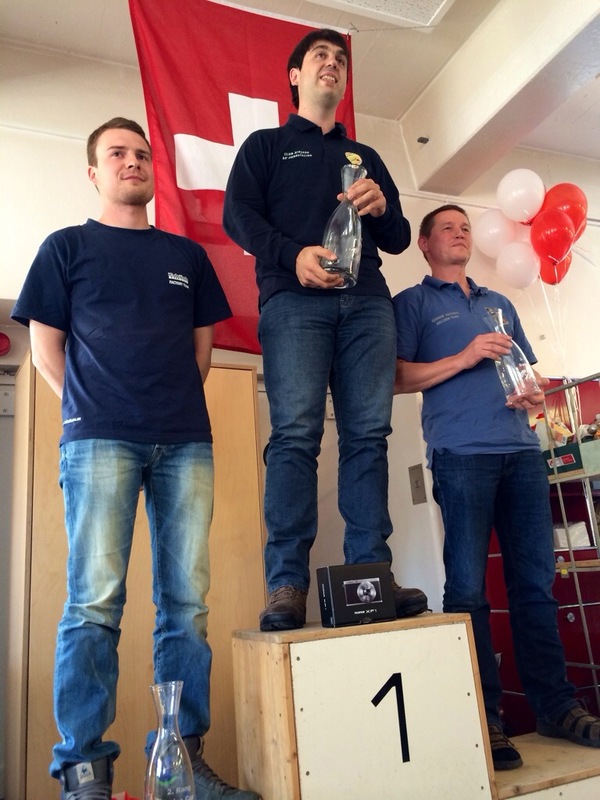 This morning was the last flight of the national championship of Switzerland. There were two tasks : a fly in (with a target placed on a beautiful old bridge) and an hesitation Walz with 4 choices. The ranking yesterday after 17 tasks was tight and we ranked 5 out of 31 pilots (however the gap between us and the three pilots behind us was quite small). Fortunately, we worked hard and were very successful this morning on the bridge (3m) and the HWZ (0.07m). We therefore scored 996 and 989 points this morning, which allowed us to finally take the second place of the competition!! A great thanks to my team and to Kubicek for their support!! Congratulations to all pilots, officials and organizers. It was a fantastic event!